During the Draft Riots of 1863, Union troops were called in to restore order. 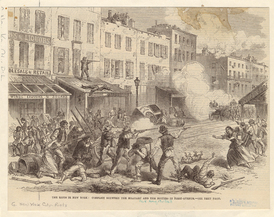 Here the rioters (pictured) battled Union forces along First Avenue, between 11th and 14th Streets. 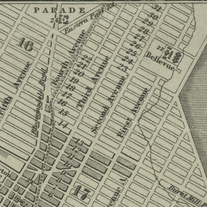 Today, Gramercy Park is a quiet place, but in 1863 it was a war zone. Union cavalry and artillery occupied the park, setting up two cannons at the northeast corner to face the rioters. With the Emancipation Proclamation, the Civil War began to be more about black freedom. Many New Yorkers were not happy about this—especially poor whites and immigrants. Newspapers of the time warned that great masses of former slaves would pour into northern cities looking for work. Then on July 11, the Conscription Act of 1863 took effect. The act made all male citizens between 20 and 35 and all unmarried men between 20 and 45 subject to military duty. However, anyone who could pay $300 could avoid service. Blacks were not considered citizens and were exempt. The growing fear and anger turned to violence, and the worst riot in the history of the city began. The first targets were military and government buildings, but by afternoon the white mobs began to turn on blacks. A nine-year-old boy was attacked, and then the mob stormed the Colored Orphan Asylum, burning the great four-story building to the ground. The violence soon moved to the docks, where a predominantly Irish mob attacked more than 100 black longshoremen, killing several. For five days, the battle raged across Manhattan from the Battery to the Upper East Side, until President Lincoln sent troops to the city to restore order. The cost of the riot was incredible. As many as 100 people were killed. More than 100 buildings were burned, and many more were damaged and looted. Many blacks fled Manhattan, and the riots drove a wedge between black and white workers that lasted through the civil rights movement of the 1960s. 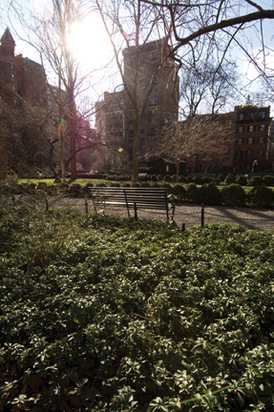 Today, Gramercy Park is a quiet place, but in 1863 it was a war zone. Union cavalry and artillery occupied the park, setting up two cannon at the northeast corner to face the rioters.